Civil War – Let's Go RVing! I just couldn’t go to sleep last night for some reason. Tuesday night is the only night I watch TV and I guess I stayed up too late and missed my sleepy time but when I did go to sleep I had a good night’s rest. Jerry quietly got up this morning and let me sleep in until almost 8:00. Love sleeping in a cold room. I heard him turn on the heat in the front so I knew when I got up and headed toward the den it’d be nice and warm and it was. We took our time doing break down and it was 10:30 before we left. Interestingly enough our two GPS’s had very divergent routes varying in about 50 miles. I “thought” Jerry’s which is shorter was mainly two lane roads and I was right. We did get to ride through the absolutely lovely back roads of Virginia though. There are miles and miles of fences, some painted white (can’t imagine) and some plain. The leaves weren’t as vivid as they have been but were still pretty although a little more sparse. Horse farms abound along with cattle grazing in the pastures. Despite the loveliness of the drive I sometimes had to just look down as we passed through narrow passages and overhead bridges. We arrived at Creekside RV Park about 1:00. I had read on RV Park Reviews that we shouldn’t follow the GPS directions to the campground and boy was that right! I called the campground and he told me what exit to take and then to just follow the campground signs. That would have been perfect except when we entered Edinburg and had to make either a left or right turn there was no sign so of course we turned left. We rode down the main street, saw the street that the GPS said to turn on and wisely said no way. It was very narrow and unbeknownst to us a sharp left angle turn and then a right turn and then a narrow bridge. I really think we would have gotten stuck. The campground is small and our site backed up to a little creek full of quacking ducks. The guy a couple of sites down was feeding them throwing feed in the creek and then entrancing them to come up on the bank by throwing more food. Wow! After we got set up and had some lunch we rode into Edinburg and went to the Edinburg Mill. It is only one of a few pre-Civil War mills still standing. The Shenandoah Valley was the thoroughfare for both of the armies and whomever controlled the valley would control the war. Upon orders the Yankees began what it now known as The Burning. They burned everything, homes, barns, livestock, fields, crops, anything that would provide sustenance. In one instance when they took the horses from the owners one of the horses was a mare with a foal. The lady screamed that the foal couldn’t exist without her mother so the soldier just turned around and shot the foal then continued on. The Burning was referred to as a grim time in a very grim war. I was surprised to hear that the homes of widows and masons were not burned though. 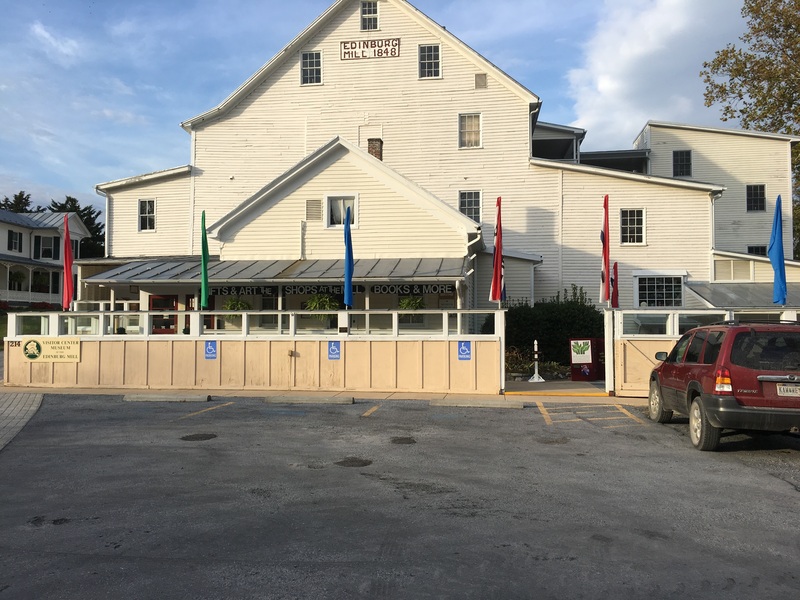 The mill is three stories full of memorabilia from the Civil War until more recent times. In fact, it is a bit humbling to see items in a museum that I remember using in years past. Although I didn’t have high hopes for visiting the mill I was definitely wrong. I would surely recommend it to anyone that happens to be in the Edinburgh area.